On that cold morning of 23 December 1981, I only wanted to look at the cloud that had turned pink at sunrise. We were climbing a hill in single file and I was looking upwards, when suddenly a hail of bullets pierced my chest. I fell on my back. My lungs grew hot and filled with blood and three minutes later, while still looking at the pink and orange cloud, I died. I never saw the man who had fired at me from behind a rock at the top of the hill. Maybe he was only a twenty-year-old soldier because, if he had been around a bit, he wouldn’t have picked a private from our column, which included three warrant officers and two lieutenants. My father always hoped that I’d go to Australia like my brother, who is a doctor. But maybe I didn’t have the talent for it. At the end of the summer just after I’d finished high school, Tehran’s airport was bombed. The war had begun. My mother locked me up in the house for nine months. She used to buy me the paper every day and, now and then, a book. Finally, one day. I’d had enough and arranged to meet Parvaneh in the park. I’d known Parvaneh since our second year in high school and in our fourth year, we’d promised to remain true to each other forever. She had pretty, orange hair and wore shiny, copper lipstick. In our third year in high school, the last time I ever visited her house furtively, one afternoon I saw her hair. Translator’s note – Parveneh, a woman’s name, means butterfly in Farsi. I still hadn’t given Parvaneh the gift-wrapped bottle of perfume that I’d bought her on the way, nor the letter I’d been trying to write to her during the nine months that I’d been locked up at home, when the volunteer patrols picked us up. Even while they were making us get into the back of the station wagon. I still didn’t understand what was going on. And later I just kept looking at my fingernails so that my eyes wouldn’t catch Parvaneh’s. They handed her over to her family with a fuss and took me to a detention centre in the south of the city, but I didn’t know exactly where. When they made Parvaneh get out of the back of the station wagon in front of her house, one of the neighbours opened their window and looked at us. The neighbour was still standing there when we left. In my cell, someone had carved a big heart on the wall with something sharp. The heart had turned out a bit lopsided. For two days, I stretched out my legs and looked at the door. In the end, they came and took me to a police station out of town. The station had brick walls topped with barbed wire. There, I boarded a bus with a lot of men whose heads had been shaved, and we set off to a training garrison. Sixteen hours later, when we got off the bus in front of the garrison gate, a sergeant made us line up and then had us run around the garrison so many times that I was still limping a week later. We were all fugitive conscripts. One night, after they’d given us some watery stew, they made us line up again and handed out uniforms that were as loose as sacks. The last time I saw my mother and father was the moment when the bus went around Freedom Square on the way to the garrison. The two of them were standing by one of the flowerbeds in the square and when they saw me, they waved. The other soldiers with their shaved heads all waved back at them through the windows. My parents laughed, moved closer and waved at all of us: and we half-rose in our seats and waved back at them. I don’t know how they knew our bus would be passing Freedom Square at that time. Five months later, when the bullets pierced my chest, the letter I’d spent nine months writing was still in my trouser pocket. The gift-wrapped bottle of perfume had been taken away from me first thing at the detention centre. I lay for hours next to a dried-up bush shaped like a horse’s head. Further away, there was a big rock that was a strange, green colour. The pink cloud gradually turned orange and then yellow, and then it disappeared altogether. Our column had lost its way deep in enemy territory and when the bullets were fired at us, no one was able to take me back with them behind the lines. In the afternoon the Iraqis came, put me in the back of a station wagon and took me to a cold storage. They stripped me naked and searched me everywhere. They must have mistaken me for someone else, because they decided not to bury me. I stayed for four weeks in a big metal drawer, which had a fluorescent lamp on top. Whenever someone opened the drawer, the lamp would switch on. On several occasions, they brought people to have a look at me. Some of them had handcuffs on and some of them didn’t. But no one recognized me. They’d all shake their heads and leave. On one of the last few days they brought two other people and put them in nearby drawers. They’d pulled out their fingernails, and their skin was covered with blue spots where they’d been burned. Three days later they took all three of us, in an ambulance with painted-over windows, to a deserted graveyard. None of the graves had gravestones. Our place had been prepared in advance. 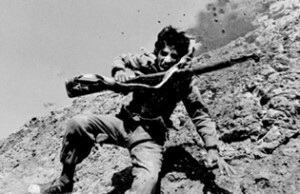 They threw me into a grave, and two Iranian POWs wearing yellow outfits shovelled dirt onto me. Then they made a mound of dirt that matched my height and lay alongside countless other mounds. None of the dirt mounds were marked with names. They’d just placed a green plaque with white numbers on each mound. Alongside the nameless graves was a row of thin eucalyptus trees that provided some shade. In his letters, my brother always used to say that Australia was full of eucalyptus, and that there were no other Iranians there. On the other side of the trees was a two-storey cement building. The people who occasionally looked out of the windows could probably see the green plaque on each grave. Beyond the graveyard was a big farm, the boundaries of which were visible in the distance in the form of a long, thin line of barbed wire. In the morning they’d bring people in a lorry to work on the farm and in the afternoons, when they went past the graveyard, there was the sound of disjointed sentences spoken in Persian. At sunset on the eighty-seventh day, when the shade from the eucalyptus trees stretched over the entire graveyard, three people who were digging fresh graves furtively came to my graveside and planted a tulip bulb next to the metal plaque. It wasn’t clear how they’d got hold of a tulip bulb, but they’d clearly mistaken me for that other person again – someone who must have been so important as to make them happy to plant a tulip on his grave. From the next day onwards, the yellow-clad POWs who went to the farm would stare at my dirt mound and, as the lorry drove past slowly, their heads would all turn in that direction. The tulip bulb gradually grew roots and the green shoot of its stem sprang out of the ground. Seven days later, three Iraqi officers who’d tied their shoelaces around their trouser ankles came and stood over the mound. They pulled out the tulip bulb and even the green plaque. Maybe it was in order to wipe away all signs of the POWs worshipping ground that they also had bulldozers dig up the eucalyptus trees, root and branch. A mechanical shovel even dug us out of the ground and threw us on top of each other. Throughout this time, shouting could be heard in Persian and Arabic from the direction of the cement building. Finally, they threw us into the back of several lorries using the mechanical shovel. As the lorries set off, they were flattening our now-empty resting places with bulldozers. The fingers of my left hand remained forever under the dirt over there. The lorries kept going, non-stop, well into the afternoon. Before sunset, we reached a place with high mountains. The lorries parked in the yard in front of a remote police station. The walls around the yard had been whitewashed. The setting sun shone through the station gate, creating a crimson square on the wall. We stayed there for two days, and the crimson square appeared on the station wall each evening. On the morning of the third day, we set off again. The road was steep and rocky. Sometimes we made slower progress than the donkeys that passed along the side of the road. Around noon we reached a deep valley surrounded by tree-covered mountains. They threw us into a long pit shaped like a canal, which had been prepared in advance. Other lorries arrived on the evening of the same day, and they threw some more people on top of us who’d been recently killed by firing squad. Their loose outfits were bloodstained and riddled with holes. Fresh blood was still seeping out of some of them. Then, the bulldozers came and covered the canal with dirt. The head of a woman with long, light brown hair tangled around her face and covering her eyes, fell right on my neck. The thin, white legs of a man had fallen on my chest, and another man’s open mouth was stuck to my stomach. My hips, in turn, were lying on the torso of a man whose ribcage had been crushed. This mayhem didn’t last very long. Sixty-five days later, a group of soldiers and NCOss came and hurriedly removed the topsoil to find where we were. They had scarves tied around their noses and mouths, and they hastily threw us all into the backs of lorries. Maybe someone had revealed the location of our resting place to some organization or other, and now they had to remove all traces of it. As we set off, the soldiers were filling the long, empty pit with old tires and covering it over with dirt. That night, as the lorries travelled through mountain passes, there was a pleasant scent in the air. A shepherd on night watch had lit a fire in the foothills. Further on, in the moonlight, were rows of beehives. The air was full of insects and the scent of wild plants. If Parvaneh had been there, we wouldn’t have slept a wink all night. We’d have lain on a bed with clean sheets and watched fire flies as they flew into our room through the open window. A little later, it clouded over and started to rain. I was lying on top of the others and my bones got wet. In the morning, as the sun’s rays were just beginning to emerge over the trees on the mountaintop, we reached a place where they were expecting us. The lorries headed down into a valley and a field was revealed in the dim dawn light. Because of the countless holes they’d dug in it, the field looked like a honeycomb. When the sun rose, men wearing masks threw us into the graves. They hated touching us, and they shoved us in using long-handled shovels. They also threw another man’s hand into my grave. It wore a rusty ring around its ring finger. The dentures of the man who’d been lying next to me in the lorry had fallen out, and one of the soldiers, rushing past, tipped it into my grave with his boot. The dentures had turned black, and they had congealed blood stuck to them. The fingernails on the hand with the ring were black and blue. A little later they tossed in someone else’s long leg bone, too. In the middle of it was a small bump, as though it had been glued together there. He must have broken his leg at some point. I’d never had a broken bone myself. Because my mother tended to fuss over me she always made sure I stayed away from any dangerous games. It was obvious that the graves had been dug hastily. The sides of my own had come out all crooked, and it had bumps on the bottom. If they’d dug down just a few shovels-full more, they would definitely have discovered the ancient grave-yard that lay just a few inches lower down. Exactly beneath me, lay an Assyrian prince clasping his cast-iron sword to his chest with both hands. If he could have raised it just a little bit, the tip of the sword would have pierced my pelvic bone. Like the first time I’d been buried, they made a dirt mound the size of my height on top of my grave and stuck a plaque with a few white numbers on it into the mound. The next day, it started raining, and two weeks later there was grass everywhere. The wild grass dried up, blew away and grew again many times. I stayed there for two thousand, eight hundred and sixty- four days. The roots of wild plants dangled in from the sides of the grave, and the Assyrian prince continued to clasp his sword. One day, some people came with shovels again and opened up the graves. Then they threw us into white sacks and stuck a number on each sack. They loaded up the sacks into a yellow lorry and drove all day. We were going back. We were still in enemy territory, but in the distance were the overcast skies above Iran. When we reached the border, it was dark. At a check point inside Iran, a few big lorries were waiting for us under big spotlights shining from high up. If my father or mother or Parvaneh had known that I’d be coming back, they’d definitely have been waiting for me there. But there was no one. It was like the bonfire night before New Year when, after we’d collected dry wood for days in advance, it started to rain on the night itself and all the wood got wet. Everyone went home: there was no one left. They arranged us in rows in the backs of the lorries and took us to the airport. There they put me on a plane, with all my excess weight made up of other people’s bones, and then we were airborne. When we landed in Tehran, it was cloudy. They took us to one of the big warehouses at Mehrabad Airport, the same place that had been bombed just after I’d finished high school. They shut the big door of the warehouse and took us out of the numbered sacks. The floor was covered with identical- looking coffins, and they carefully arranged us into them. Some people were standing further away, crying. When they finished, they threw a big flag over each coffin and stuck a photograph in front. On my coffin they stuck the photograph of a young man who had a thin moustache. I’d never had a moustache in my life. It was clear that, somewhere in enemy territory, my number had been mixed up. Soldiers with well-fitting uniforms and crimson aiguillettes lifted the coffins one by one and arranged them in rows in a big, open-air area outside the warehouse. A large crowd had gathered around the area. Many people in it were crying, some holding up framed photographs of young men. My mother and father were not there: there was no sign of Parvaneh either. If I’d had a face, there might have been someone there who’d have recognized me. Many cameramen were coming into the open-air area, which was surrounded by soldiers, and filming everything. Someone stood on a raised platform behind the coffins and delivered a speech to the crowd. In the middle of the crowd was one familiar face. It was the photograph of a smiling young man with light-brown hair. It was a photograph of me. An old woman with a brown scarf was holding it over her head. It was my mother. It was definitely her. She’d really aged. My father wasn’t there. When they’d waved at me in Freedom Square, they had been together. Mother had grown smaller. Father must have died; otherwise she wouldn’t have come alone. Once the speech and the filming were over, they put each of us into a station wagon and headed out of the open-air area. As we drove around Freedom Square, people would occasionally stop near the flowerbeds and look at the fleet of station wagons. They took me to an old house, which had a backyard with a small pool. They’d prepared a bed for me there in advance, and had placed so many pots of geraniums around the bed as to put the bees in daze. Until night-time, various people would come, rest their foreheads on the coffin, cry and leave. Only one old woman was there the whole time. Her nose had turned red from crying so much. She resembled my mother a bit when she cried. Maybe people all resemble each other when they cry. Every five minutes, she’d get up and kiss a corner of my coffin. But whenever she wanted to open the coffin lid, a few people would take hold of her and coax her back onto her black leather chair. The next morning, they put my coffin back into the same station wagon and took me to the top of a beautiful hill outside the city, surrounded by old trees. They’d dug a few big, magnificent graves for us there. When they wanted to put me in my place, they opened the coffin lid. A few people were still holding back the old woman, but there was no need: she wasn’t moving at all. She was staring at the rusted ring in that other person’s finger bone. She wasn’t even crying. They buried me with great care and placed a beautiful black stone that matched my height on the grave. On top of the stone they affixed the photograph of the young man with the thin moustache. The old woman was still staring at the gravestone. They’d brought her a chair to sit on. She must have been suffering from rheumatism. Like the day before, a crowd had gathered there, and cameramen were filming everything. There too, they’d set up a raised platform, and someone was making a speech. It was a cloudy day and the flashbulbs on the cameras shone like lightning in the sky. Then they all left and took the old woman, too. From here, you can see Tehran in the distance. It’s so far away that I can’t find Parvaneh’s house. The letter I was trying to write her for nine months might still be in storage somewhere in Iraq. The bottle of perfume was no doubt buried in the rubbish. If Parvaneh ever comes this way on a day out. I’ll be able to see whether she still wears shiny, copper lipstick or not. Spring is a good season. Sometimes it’s sunny and sometimes it rains. In the sky, there’s a cloud that’s turned pink on top. An orange butterfly is sitting on a grassy patch with yellow flowers. Now it flits off and goes towards the old trees. 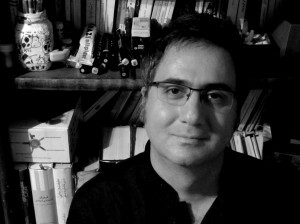 Alireza Mamoodhi Iranmehr is a writer, literary critic and screenwriter based in Tehran. He has published more than one hundred literary articles and stories in Iran, England and Germany. He was a member of the policy council of the “Discovery Moment” Creative Writing Competition (2008) and “Intellectual World” Creative Writing Competition (2010). He has taught literary criticism and creative writing at Tehran Cultural Collections and Iran Association of Literature since 2002.